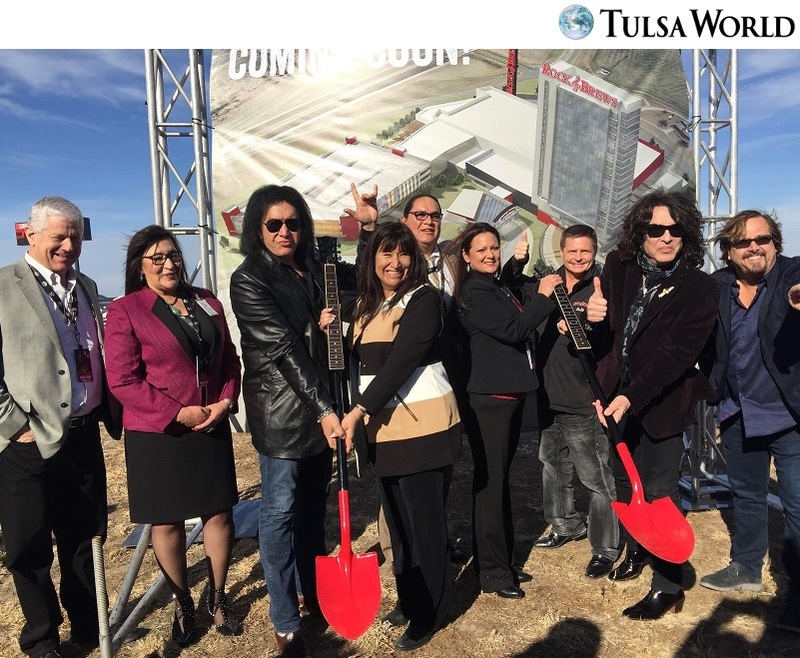 BRAMAN — Gene Simmons and Paul Stanley of the rock band KISS are teaming up with partners, including the Kaw Nation, to bring a shiny new casino resort to a tiny town in north-central Oklahoma. “And I say why not?” Stanley said at a news conference Thursday to announce the Rock & Brews Casino Resort that will spring up alongside Interstate 35 in the Kay County town of Braman. “Someone just said to me ‘Why would you do it in the middle of nowhere?’ And I said ‘Everywhere is somewhere.’ There’s no such thing as nowhere. Simmons and Stanley traveled to Braman for the news conference, which temporarily doubled Braman’s population, listed at 217 at the time of the 2010 U.S. census. There was seating for 208 inside a heated tent where the gathering was staged. The only reason there were a few empty chairs is because many people chose to stand and watch the rock stars deliver big news. Simmons said he and Stanley will return for the grand opening “if everybody lets us.” Since an events center is part of the resort, will KISS perform? “Everything is possible,” Simmons said, adding that the band has been coming to Oklahoma since before some of the reporters in attendance were born. Per the casino name, the resort will of course include a Rock & Brews Restaurant. Rock & Brews is a rock-inspired restaurant and entertainment concept founded by Simmons, Stanley and their partners. The first Rock & Brews opened near Los Angeles International Airport in April 2012, and expansion led to locations in other places, including Oklahoma City. Other dining options at Braman will include a 100-seat restaurant, a World Tour Cafe and a Start Me Up coffee outlet. Kaw Nation Chair Jacque Secondine Hensley took a turn at the microphone and said, “Can you believe this is happening here in Braman?” She said the casino resort will spark economic growth and provide more than 1,000 construction-related and permanent jobs. After a “real” groundbreaking, the casino resort is expected to be completed in approximately two years. Simmons, when asked about bringing the resort to a map-dot town in Oklahoma, segued into a history lesson. He said people forget that everything begins small — including birth — and how you treat growth is the most important thing. “If, at the outset, the intention is to create jobs and be good neighbors and be civic-minded and all that stuff, that’s good,” he said. “Because all little towns didn’t start off that way. The California Gold Rush, there were lots of people who were in it for themselves and didn’t care about whether or not they were going to create jobs or anything. They were ‘all for me, all for me.’ That resulted in lawlessness and all kinds of stuff.